Agricultural Science with Vernier #22: Lemon "Juice"
Recommended for Elementary through High School. “Juice” is a slang term sometimes used for electricity. Batteries are made up of one or more cells. Cells often consist of two different materials in a solution and connected to each other by a wire. In this experiment, you will study some basic principles of cells using the juice of a lemon as the cell solution. 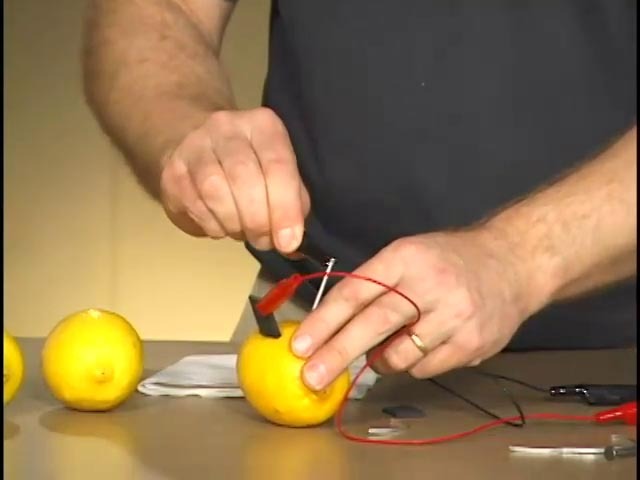 You will place small pieces of two different materials into the lemon, and a computer will be used to measure and display the voltages produced. Measure and display cell voltages. Discover which combinations produce a voltage. Decide which combination makes the "best" battery.